Home » Bayliner Boats » Bayliner Capri 1850 Ls Bowrider Speedboat. 4.3 Lx V6 Mercruiser Sterndrive. Bayliner Capri 1850 Ls Bowrider Speedboat. 4.3 Lx V6 Mercruiser Sterndrive. 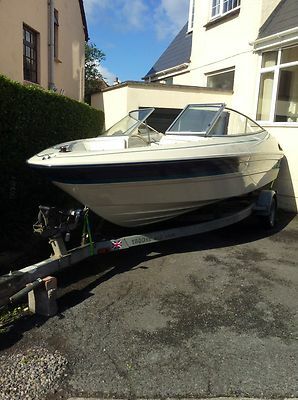 1995 Bayliner Capri 1850 LS Bowrider Speedboat with trailer. 19′ 4″ in length. 4.3 LX V6 Mercruiser Sterndrive inboard engine with High five propeller. Cream and blue leather interior with little split in one of the rear seats. (See photo). For the age of this boat I would say you would be hard pushed to find something better!She has had very limited use and when I purchased this boat the previous owner said it had only done around 60 hours on a new engine, so since 2010 I would say she has done 100 hours max. Recently had a new starter motor, battery, carb clean up and various electric’s renewed. Also various quicksilver oil, fenders, a couple of life jackets and a towing wedgie included with the sale. 7 seats in the boat. I really have little knowledge on boats and have only used her for a little fishing and water sports. A perfect boat for water skiing, wake boarding and towing various rings. Very fast and powerful speedboat. Any viewing or inspection very welcome. Only sensible offers please silly offers will not even be replied too..First to see will buy. Cash on collection only please. (Could tow locally in the torbay area). Any questions I will do my best to answer ASAP. Thanks you.